Make some birthday flower cards to please the gardener's heart. Yes, birthday flowers in a handmade card. These flowers will bloom all the year round. Your gardener's friend or beloved family member can place these birthday flowers handmade cards around the house - winter time too - and have flowers blooming everywhere she turns. Isn't that what a gardener loves? So make many of these birthday cards and bring a bit of the garden into the recipient's heart. Here's one example of a handmade birthday flower card I have created with a QuicKutz's die-cut flower. Below are the items needed to make this birthday greeting card followed by the step-by-step instructions. dark pine green color cardstock 12" x 6"
lighter green textured card with adhesive 3.5" x 6"
Paste lighter green card to the left front of dark pine green card with glue or double-sided tape. Cut flower die-cut using QuicKutz machine on white cardstock. Stamp flourishes in spanish moss green color on the white cardstock. Pour clear embossing powder on image and shake off excess. Before heating with heat gun, tidy strayed powder with small brush. 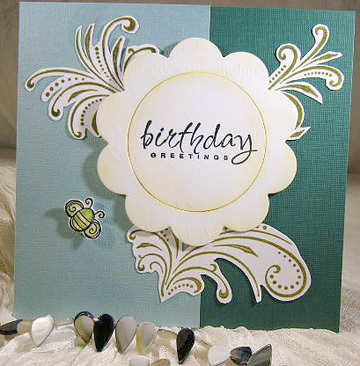 Stamp Birthday Greetings with black pigment in on flower die-cut's center. Pour clear embossing powder on the birthday greetings. Shake off excess powder and use a small brush to brush off scattered powder. Use the heat gun to melt the powder to get a raised effect. Use a sponge or polyester fiber to color edges of flower die-cuts. Trim stamped flourishes near to the edges. Paste flourishes to card front with glue or double-sided tape. Attach die-cut flower to card front with double-sided foam tape for a 3 D look. Stamp bee image with black pigment ink on white cardstock. Heat embossed using clear embossing powder. Trim and attach to card with double-sided foam tape. For more birthday card ideas, check out my OhHappyBirthday website. Make birthday flower cards for gardeners...or non-gardeners who love flowers. What do you think? Won't you like to receive a homemade card like this too? So make more and decorate your home with these cards. It's really delightful surprising guests with these homemade creations around the house. Use the card design idea for Friendship card, Mother's Day card or just a Thinking of You's card. Will be adding more examples of these cards so do bookmark this website to see the new handmade greeting cards.